The Real Madrid superstar has a contract with Nike that is worth a reported £1 billion, but that is just the tip of the iceberg. Not only does Cristiano Ronaldo promote sportswear, he has sponsorship deals with a raft of companies across a number of different industries. And some of them can be very surprising indeed. Ronaldo raised eyebrows around the world just a couple of months ago when he announced a partnership with the Egyptian steel production industry. "Have you ever related steel to eco-friendly? I did.. that’s why I’ve partnered with the most safety-oriented steel brand #Egyptian_Steel", Ronaldo wrote in a post to his 63.9 million Twitter followers. That gigantic following makes Ronaldo a very attractive proposition for a lot of companies, especially when coupled with the 115 million followers he can boast on Instagram. He has in the region of 300 million followers across his Facebook, Twitter and Instagram accounts. It has been reported that Cristiano Ronaldo is paid in the region of $400,000 for each sponsored post on Instagram, ranking him in the same bracket as celebrities such as Selena Gomez and Kim Kardashian, as well as Kylie Jenner and Kendall Jenner. How much does Cristiano Ronaldo earn? According to a list produced by Forbes in June, Ronaldo banked $93 million over the previous 12 months to be named the richest athlete in the world in 2017, beating out Lionel Messi. Some $58 million is that total came from Ronaldo's work on the pitch, his salary paid by Real Madrid in salary and bonuses, with the remaining $35 million coming from sponsors. While Ronaldo's lifetime deal with Nike is by far his biggest sponsor - they pay him a reported £14.1million each year - a range of companies including Tag Heuer, Herbalife and Abbott Labs pay him to endorse their products. 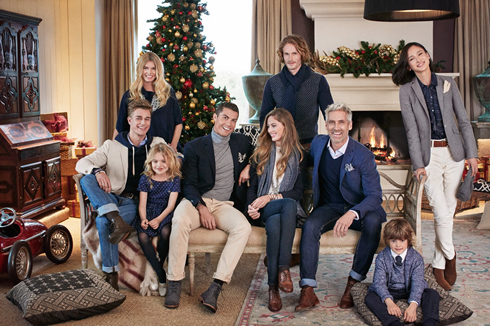 And Ronaldo, evidently smart enough to be planning ahead for his retirement, has a variety of his own wares to sell as well, including shoes, underwear, jeans and fragrance. Ronaldo is also developing a line of hotels - there are two open so far, with more on the way - while he even has his own photo app - CR7 Selfie app by Cristiano Ronaldo. Although other stars have also endorsed online gambling sites, Ronaldo is by far the biggest name in the world of sport to have done so. PokerStars is one of the companies Ronaldo has joined forces with, having paired up with the firm in May 2015. CR7 has featured in adverts for PokerStars with NBA star Dwyane Wade. The terms of the deal between Ronaldo and PokerStars have not been released but it is likely to be one of the biggest partnerships between a sportsman and a gambling firm. Ronaldo acts as a brand ambassador, which means that his role is to help promote PokerStars - as well as the game of poker itself - to a huge new audience. "I started playing poker a few years ago, and I love the competition, strategy and fun. I'm looking forward to taking my game to the online and live poker tables and meeting my fans head to head," Ronaldo says of his association with PokerStars. "Although football is my world, poker has always been my game. I'm very excited to join the team." Ronaldo supposedly plays on PokerStars under the User ID C.Ronaldo, so look out for him on the tables. Fairly recently, Ronaldo also announced a deal with an online brokerage based in Cyprus, Exness Group, which handles contracts for difference, or CFDs. While these CFDs can be controversial due to the risks they pose, Ronaldo praised the way Exness "gives back to the world", as well as how the firm offers the "highest quality of services" and also works hard to foster a "socially conscious culture". Football clubs including Ronaldo's La Liga rivals Atletico Madrid and Premier League sides Manchester City and Liverpool have associations with firms involved in CFDs as well. 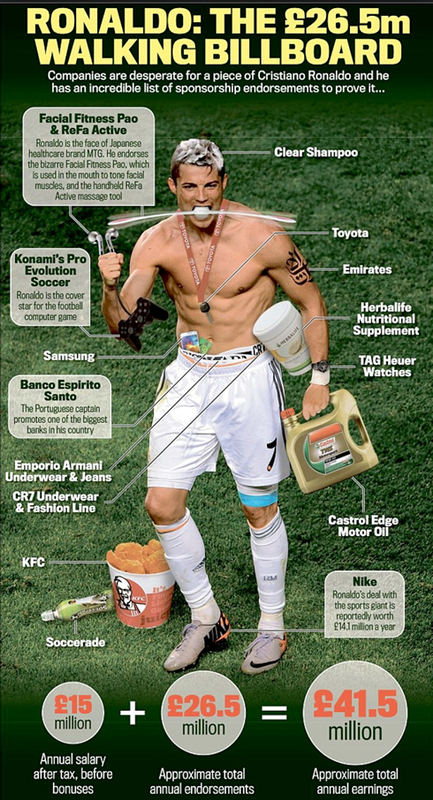 What other sponsors does Cristiano Ronaldo have? The list of sponsors to have signed up with Ronaldo over the last few years is almost endless. 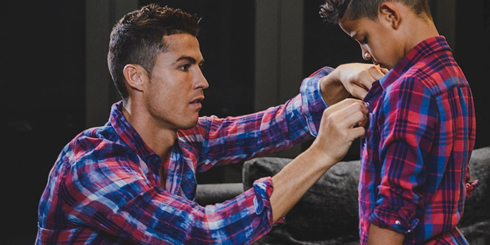 Tag Heuer watches provide Ronaldo with one of his most lucrative deals and the Portugal star is often seen showing off his timepieces in posts on his various social media accounts. Ronaldo's favourite watch seems to be the Tag Heuer CALIBRE HEUER 02T, which retails for just over £20,000 on the company's official website. Of all the things he is most famous for, Ronaldo is known for his incredible body, so it is no wonder some of his sponsorships play on his high level of fitness. The 32-year-old teamed up with electronic muscle manipulator SixPad for a series of Japanese adverts. Mobile games have exploded in popularity over the course of the last few years, so of course Ronaldo has one that bears his name. Cristiano Ronaldo: Kick'n'Run was launched at the start of the year and the app has been downloaded more than five million times on Android devices alone. The CR7 Selfie app by Cristiano Ronaldo is being promoted on the star's own website too. Users are encouraged to share their snaps on social media in the hope of becoming the "fan" photo of the month. 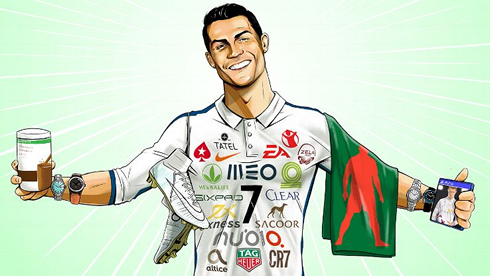 What do sponsors get out of linking up with Cristiano Ronaldo? As sponsors pay a small fortune to have Ronaldo promote their products, what are the companies themselves getting out of the association? Well, according to a 2017 report by Hookit - a firm that - tracks sponsorship value in social and digital media - Ronaldo produced close to $1 billion in value for his sponsors via social media. This is partly as he is a relatively active member of social networks such as Instagram and Twitter, while he is usually free of the scandals that have hit sports stars like Tiger Woods. Teaming up with Ronaldo is therefore extremely lucrative. The Real Madrid star makes cash out of the sponsorships and so do the businesses. Everyone's a winner! Cristiano Ronaldo next game for Real Madrid is on November 25 of 2017 against Malaga. You can watch Juventus live stream, Real Madrid vs Malaga, Tottenham vs WBA, Manchester United vs Brighton, Liverpool vs Chelsea, and Borussia Dortmund vs Schalke 04, all matches provided from our live football game pages.